On June 6th, Chuck Wendig issued a challenge, http://terribleminds.com/ramble/2014/06/06/flash-fiction-challenge-rise-of-the-phoenix/. 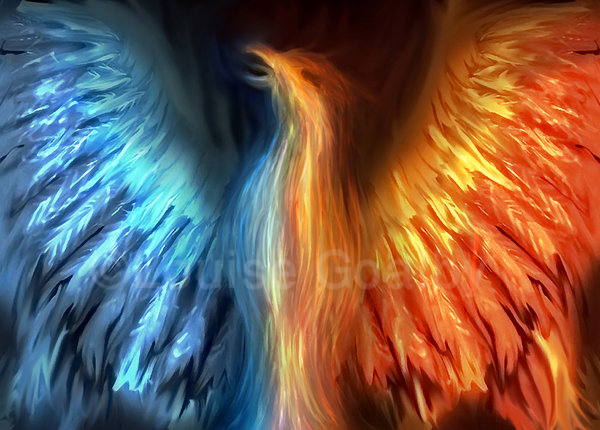 Write a flash story that in some way relates to the fabled Phoenix of legend. Here’s my take. Click on the link and view the blog comments to see what other authors have done with the story. I think you’ll like them. “This tower is on the top of an extinct volcano,” the fire tower keeper, Brigette, explained to the group of nine 4-H members and their leader. The kids ooh’d and eyebrows went up as mouths fell open. The kids looked reassured. That was just before the ground rumbled and the tower began to sway. “What the…” she started to swear but thought better of it with all the kids around. What’s going on? This area is seismically stable. “Get down the ladder,” she yelled as the radios began to slide across the table and the humming bird feeders swung wildly in the air. Kids ran down the ladder, the 4-H leader encouraging the ones who were frozen with fear. “Let’s go sweetie.” Brigette took the hand of a little boy who was staring, wide-eyed. “Come on, we need to get down the stairs.” She pulled him toward the hole in the tower floor. The sound of the descending Leader and children echoed up the industrial steel steps. They were half way down the tower when she saw her house begin to crumble. The ground was shaking and the kids already on the ground screamed. Brigette saw several of them fall. The tower swayed over her. “Let’s go, kid.” He latched onto the hand rail and wouldn’t move. She grabbed his wrist and pulled. They had to hurry; she didn’t know how much longer the tower would stand in all the shaking. She half carried, half dragged the boy down three more circles of the stairs, the tower creaking from every rivet joint. Brigette dragged him to the Leader and turned to watch her house. The roof was caving in, the walls were tipping into the middle of the house. Boards snapped, glass shattered and the collapsing walls and roof roared. A huge cloud of dust rose over the house. The Leader shrugged and jumped into the car. “Buckle up everyone.” She did a three-point turn in the van and raced along the dirt road, dirt from her tires fountained into the air. Brigette raced to her car. At the door, she realized there was more to the noise of the house collapsing than just the wood and the glass. As she watched, debris rose up and slid away from the house. A claw, the size of bus came out of the middle, shoving bits of wall and plaster out of the hole, then another, followed by a beak. Brigette blinked. A head poked up covered in red and gold feathers. It screeched as it pulled itself out of the ruin. As the sunlight hit the feathers, they began to light; waves of fire covered the monstrous bird. A bit of egg shell flared into flame and fell off of the bird’s body. Brigette got in the car and turned the key. The engine turned over and the bird turned its black eyes toward the noise. It screamed again. Chills ran down her spine as she shoved the gear shift into drive. “Holy crap,” she whispered as the giant bird spread its wings over the remains of her house. It flapped once, twice, screeching each time. Heat washed over her. She sped out of the gate and followed the dirt road down the mountain as fast as she could negotiate the hairpin turns. At the nearest Forest Service office she tried to make a report. They were too busy. The area she’d just left was enveloped in forest fire. On the TV, there were reports of a giant bird flying overhead. A reporter was interviewing an ornithologist from the University. “It’s a Phoenix,” he told the camera. “But those are a myth,” the reporter said. Brigette stared. A Phoenix? The whole southwest is going to burn. She grabbed a Ranger, “The TV says it’s a Phoenix. Look!” She pointed at the television. Pictures of the beast were being shown as people took pictures of it from the ground. Later in the day Emergency Defense offices opened. People were told to evacuate. The Governor appeared on TV during a phone call to the President. Aid in the form of the Air Force and Emergency Management was promised. The next day there were reports of other Phoenix’ arising from extinct and dormant volcanoes around the world. It was now an International emergency. With only the clothes on her back, Brigette drove to Nebraska; an old college friend lived there, far away from any volcanic activity. A year later, people huddled in caves or collapsed stone buildings, the land around them burnt and blasted. Brigette and her friend had joined forces with a few other survivors. They had a garden started and life was settling in. They learned to set snares for rabbits, no one wanted to be outside where a Phoenix, high in the sky, could see them and swoop down. The Phoenix were excellent hunters, people didn’t roam too far away from stone shelters. Altan stood on the hilltop, wrapped in his cloak against the chill night wind. It was summer but up here, the wind blew cold, especially at night. It was midnight, nearly time for his relief, Bora, to come up. As the Chief of the Watch, he could have taken the day watch but he liked the night. It was peaceful and quiet, just him and the stars. He checked the signal fire pile, everything was in readiness. The brazier held coals, ready for him to thrust the torch into, and it helped to keep the watcher warm. All was ready for Bora. As he stood, watching to the north where the next signal fire was, Altan could hear Bora coming up the hill. The Visigoths were on the move, he’d heard from the runners carrying messages to the Roman fort at Demre to the south. He hoped they’d decide to attack to the east going to the Black Sea but he knew that was a futile thought. Demre was a port town at the east end of the Mediterranean, near the straights leading to the Black Sea. It was a ripe target, one they wouldn’t pass up. Bora was close. Altan could hear his breathing and dislodged rocks rolling down the hill. He stared to the north, there! The signal fire was lit; he could see the sparks flying into the night sky. They knew the danger. “Are you sure?” Bora strained to see into the darkness. “It’s not there, Altan.” Bora’s heavy breathing from his run up the hill was quieting but the worry was in his voice. Bora thrust the torch into the brazier. It sprang to flame and he touched it to the pyre. They stepped back as it roared to life.